~ or visit ~ Amazon; Barnes & Noble; Indy Bookstores. From one writer to another, I'd like to let you in on a little secret: the statement, "I could write a book," is true for the young as well as the old. Over our particular lifetimes we have crossed and traveled many paths where once none existed. We have done a tremendous amount of living and have witnessed many great changes within our own circumstances. Each of us has a memory full of experiences that we can write in our own memoir book. Even before Scheherazade, there have been storytellers; members of a family who could spin yarns to entertain those listening. In this new millennium, many of the old tales passed down from generation to generation have now been left behind and forgotten. In order to bring them back, people like you and I are beginning to record these family stories. Those who write are passing on family traditions, values, patterns of belief and even feelings. Family members are being defined and given an identity that has a great sense of meaning. As adults, the insight into our emotions starts when we begin to express them to others. We can acknowledge and show our love, joy, pain, or fear in our writings. Sharing these feelings with others will help them grasp their own emotions and conceive how things really were in another person's lifetime. Your reader or family member doesn't expect everything you write to be a news flash, but he does expect you to be honest and tell what part you contributed to the family history. You are who you are because of the life you have led, and it goes beyond the funny family stories, the sad times, the good times, the bad times or the happy times. Connecting with your own past in a memoir, autobiography or personal experience story is a way for future generations to get to know who and what you are. It is history in the making. A record of modest immortality. A partial list of contents. Trying to decide if the writing life is for you? Then start with a very important book Learning to Write the Easy Way for Fun, Posterity, Money by Dorothy Ann Skarles. Whether you write it as it happened or turn it into a fictional novel, your fond memories and personal experiences can be a book that captures both the past and the present--even if you've never written before. 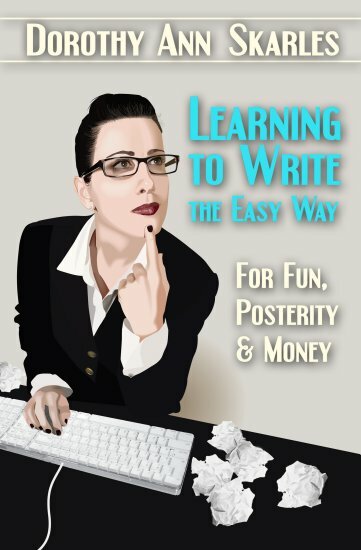 Dorothy Ann shows how to put your life and times in easy writing steps that combine specific fiction techniques with non-fiction. Learning to Write the Easy Way Copyright © 2007. Dorothy Ann Skarles. All rights reserved by the author. Please do not copy without permission. Dorothy A. Skarles who writes under daSkarles has appeared in a variety of publications. She has published more than two hundred articles in trade journals, magazines and newspapers. She earned her first byline as a cooking columnist for a local family owned newspaper in California. Cover artwork by Kurt Ozinga. All rights reserved.